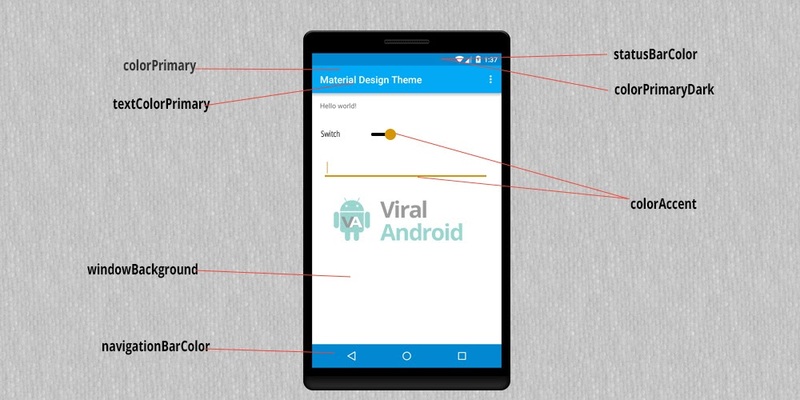 Google has introduced a new design guideline with the release of Android 5.0 (Lollipop) known as Material Design, and with this guidelines Google provide Material Theme to the android developer. This is a new user interface. In this post, I will show you way to use custom material design theme and color in your application. Here I have used Theme.Material.Light.DarkActionBar as app theme. You have to create a colors.xml file in res/values folder to define custom theme colors. After defining theme colors, your colors.xml file seems like this. Look at following image, here I have shown meaning of colorPrimary, colorPrimaryDark, colorAccent, windowBackground, navigationBarColor, statusBarColor, textColorPrimary. Here, I have added status bar color, action bar / app bar color, app background color, navigation bar color, etc. that we defined before in our colors.xml file. Your styles.xml file seems like this.